Now you don't need any extra hardphone or SIP phone. Now vicidial and SIP phone is available on one web interface. 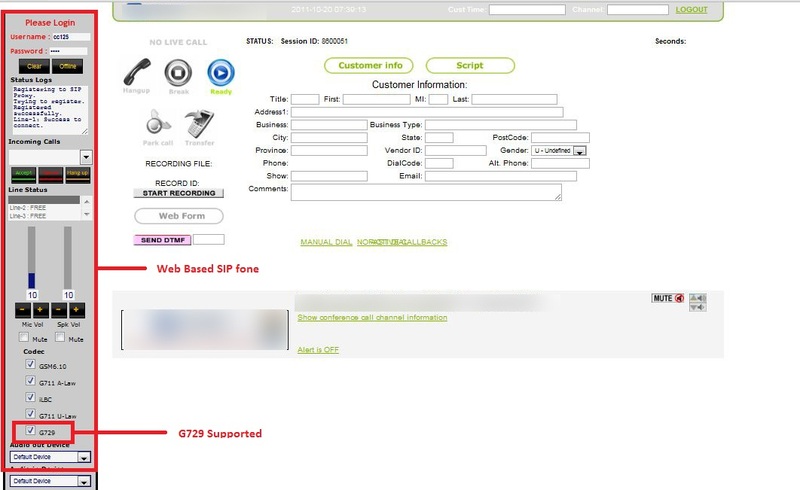 our based SIP phone is G729 supported. now you can also get this. any one interested give me a message. Any reason you didn't use the existing webphone frame for your integration? At this point it really is pretty trivial to integrate a webphone with vicidial. In fact I've seen 6 different web phones use the standard webphone frame in vicidial already. That webphone sure has a lot of stuff on the screen, is it java-based? How is the G729 codec licensed? the codec G729 is licenced i think with the free one . I need implement Web Phone in Browser with Vicidial, but, i dont know how to implement, maybe you can help me with documentation about this topic, and other way, if you know about other free software that i can implement with Vicidial, that not is Zoiper. this is same on webrtc or different? Viciphone is now built into vicibox 8.1.2, and works within the web browser using webrtc, correct.